The roots of Number TEN Architectural Group, a firm responsible for a number of Winnipeg’s signature buildings, date to the 1950s. It was during this decade that two earlier practices, Waisman Ross and Blankstein Coop Gillmor Hanna, began. The first of these, Waisman Ross, was founded by Allan Waisman and Jack Ross – then both recent University of Manitoba graduates – in May of 1953, with offices at Room 308-356 Main Street in the Great Western Building. The second, Blankstein Coop Gillmore Hanna, started with a 1956 partnership between University of Manitoba and Illinois Institute of Technology graduates Morley Blankstein and Isadore Coop. The two were joined by University of Manitoba and MIT graduates Alan Hanna and Doug Gillmor in 1959. Much of Waisman Ross’s early practice consisted of small rural hospitals. One of these was a hospital in Teulon, Manitoba, for which the firm won a Massey Medal in Architecture honourable mention. Larger commissions in Winnipeg came in 1955 and 1956 and, notably, included the new Winnipeg Builders Exchange offices at 290 Burnell Street, a clean-lined, classically proportioned building in which the courtyard space contained a mosaic-mural by renowned Canadian artist Takao Tanabe. Another example of public art – yet again in mosaic-mural – is a Robert Bruce piece gracing the entrance arcade of the Astra Building, at 208 Edmonton Street, another Waisman Ross building of the same year. In 1956 – as Waisman Ross was engaged with such designs as the Builders Exchange – Isadore Coop formed a new partnership with Morley Blankstein, with whom he had worked at the large Winnipeg firm of Green Blankstein Russell. Three years later two other young architects, Alan Hanna and Doug Gillmor, enlisted with the practice to form Blankstein Coop Gillmor Hanna. Its early years featured a number of architectural competition efforts; in 1957 Blankstein Coop came second in an Alcan competition for a Toronto office building. The following year the two young designers competed against 90 others in the national competition for the new Winnipeg City Hall, receiving an honourable mention. The firm’s luck changed in 1961 when it won a national competition for the Mendel Art Gallery and Conservatory in Saskatoon (constructed in 1965) and an award for the Canadian Housing Design Council for a multi-housing development at the corner of Grant and Centennial. The office was also responsible for such works as the 1961 Isbister and 1962 Pharmacy Buildings, both at University of Manitoba. Waisman Ross and Blankstein Coop Gillmor Hanna merged in 1964. The amalgamated practice was located in the former Waisman Ross office building. 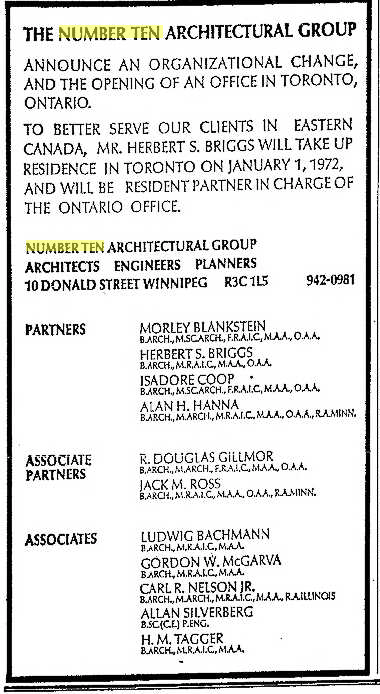 Following a period operating as Waisman Ross Blankstein Coop Gillmore Hanna, this ungainly title was changed to Number TEN Architects, in honour of the building’s street address. After this point the firm met with continued success, creating a number of signature structures with notable architectural design. Benchmark projects of these years included the Thompson General Hospital, the Market Mall Shopping Centre in Saskatoon (a Massey merit winner), the Fletcher Argue Building and Theatre at the University of Manitoba and the Northstar Inn on Portage Avenue. In 1969 the firm won praise and a Canadian Architect Annual Award for Riverside Elementary School in Thompson, Manitoba. One highly notable work was the Royal Manitoba Theatre Centre (174 Market Avenue, 1969-70), a 785-seat auditorium housed in a Brutalist environment featuring the extensive use of exposed concrete. In 2009 the building was named a National Historic Site. Another important project was the University of Manitoba Student Union Building (also known as University Centre). During this era the firm also partnered with architect Gus Da Roza to execute his singular, angled composition for the Winnipeg Art Gallery (300 Memorial Boulevard, 1970). Another highly visible commission was that for the Winnipeg Convention Centre (375 York Avenue, 1972-1974), a heavy masonry block perched upon concrete columns. Number TEN’s approach continued to evolve as it participated in the design of such later efforts as the Canadian Embassy in Islamabad, Pakistan; the Churchill Townsite Redevelopment; the concrete, suburban Winnipeg Taxation Centre (66 Stapon Road, 1979); the St. Vital Shopping Centre (1225 St. Mary's Road, 1979-1985); and the Tyndall stone, glass and metal Law Courts Building (408 Kennedy Street, 1984). The firm has also more recently executed plans for such sports complexes as Shaw Park (1 Portage Avenue East, 1999) and the MTS Centre (300 Portage Avenue, 2004), both of which employed red brick to lend a feeling of historicism and context. Its more recent work has attempted a more avant-garde manner; examples are the Winnipeg Humane Society (45 Hurst Way, 2007), a striking fusion of large expanses of glass, limestone and wood, and the angular Qualico Family Centre (Assiniboine Park, 2012). Number TEN has also recently completed the renovation of the 1919 Metropolitan Theatre (281 Donald Street, 2013) into the Metropolitan Entertainment Centre. This project builds upon the firm’s past experience with historical reuse – the much acclaimed Forks complex (1986-1995). Today the firm has more than 80 employees in offices in Winnipeg, Regina and Victoria. Its legacy is a body of work that was created by some of Winnipeg’s most talented and creative modernist architects, many of whom went on to form their own practices. “Central Park Lodge.” Canadian Architect 8 (July 1963): 78. “Manitoba Theatre Centre.” Canadian Architect 13 (December 1968): 52. “Theatre Centre.” Canadian Architect 16 (September 1971): 62-65. "Absolutely Magnificent." Winnipeg Free Press. 17 November 2004.